Enhanced Magnification has helped many people with low vision regain a level of visual independence that is not achievable with conventional magnifiers. Using a screen and camera system, not only allows the user a greater level of magnification, it also gives an even magnification across the whole viewing area. In addition, greater contrast and a range of alternative foreground and background colours can easily be achieved to further enhance the reading experience. The viewing area is the size of screen. For example a portable device may use a 3.5” screen but a desk top device may use a 22” screen. For many people, it has given them the visual independence they thought they would never regain. Your own viewing requirements will determine the best screen size for you. Ask for a demonstration to find the most suitable product for your needs. Desktop devices often incorporate an XY table. This is where the viewing material is placed. 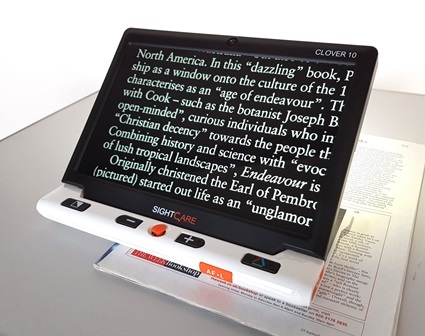 This allows easy movement of text under the camera, so the user can remain focused on the viewing area when reading, writing, doing crossword puzzles or looking at photographs. Many products are independent and have been designed for ease of use and best image quality. No computer knowledge is needed. More technical products are available, often for use in a place of work or in an education environment. If your requirements are of a more technical nature please do not hesitate to contact our sales consultant.